I’ve participated in numerous Math Trades on BGG including the 1st, 2nd, and most recently, the 5th largest (total number of games) in BGG’s history. For the uninitiated, Math Trade bring together lots of people who have items they’re willing to trade for other items. In general people offer and receive games in trade but it’s not uncommon for trades to involve other products like gift certificates, DVDs, electronic equipment, tickets, magazines, second born children, etc. You name it, somebody has probably offered it in a Math Trade. BGG only provides the listing mechanism through its support of “GeekLists” but other 3rd-party software is used to align wants with offers, organize and maximize trades, etc. To make it more interesting, the trades are not necessarily 1:1, but indirect. I may ship a game to a different person than the person who sends me the game I wanted in trade. Take a moment to let that sink in. Hundreds of people, all trusting one another to ship games (and other stuff) to one another. It only works well when everybody plays by the rules and everybody plays the role of a good citizen of the trade. It all hinges on the honor system. Entering into a Math Trade, especially the really big ones, is daunting to newcomers. Here’s a little guide to the Five Stages of a Math Trade. I subscribe to the Math Trade Announcements forum so any time there is a Math Trade, I get a subscription notice and I jump out to BGG and see what kind of trade is being hosted. I like the big trades in hopes of being able to choose from thousands of offers, the smorgasbord of goodness. However, many times I don’t see what I want to see so I have to resort to posting items to the trade’s “request” list in hopes of finding someone who will offer the items I want. Without good trade offers, I feel lonely, left out in the cold. I only offers the really good games. Who can deny that goodness. My “like new” is like, well, like really new, hardly played, sure…punched, but just a little dusty. Why don’t I see hundreds of dollars in gift certificates being offered for these games! Why should it matter that my copy of Oasis is the 5th copy being offered; my copy is the good one, right? I subscribe to the “request” and the “offer” geeklists so for the big trades, I receive hundreds of subscription updates every day and I can see the lists grow by leaps and bounds and like a hungry dog seeing a line of Beggin’ Strips, I follow each subscription to the end reading every comment, update, and reply. But as every trade progresses, I start seeing the eccentricities of users kick into full force and I have to refrain from commenting. Some people are rude. Some people don’t recognize how far out on the bell-curve of normality they are. But then again, I remind myself that I’m on that bell curve of behavior myself and the curve is different for everybody. In my next Math Trade I’m going to strive not to trigger comments where someone thinks I might be more comfortable in Nazi Germany. Godwin’s law must apply to Math Trade Geeklists as well. The process of creating your want list splits you into two personalities. On one hand, you want those good games that others are offering and on the other hand, you’ve got these good games you have to give up to get them. Getting these two independent entities to work together is difficult. One side points out shipping costs and some sentimental memories of playing a game, the other points out practical facts like you’ve not played the game in four years, your group hates it, there’s a small tear in one corner, it’s got no box fart. Meaningful stuff! You’ve got to consider everything! I start questioning my wants and begrudging my offers. I’ve even read the small print that what I thought I was trading for wasn’t exactly what I thought I was trading for. What?! there’s no expansion with that?! That’s the first edition that had mold problems?! And the results are in! And you just have to bend over and take what you get. But if you enter into it knowing that since you’re in complete control, you shouldn’t ever be disappointed in what you do get. It’s not unlikely that you won’t be disappointed in what you don’t get but at least you’ll hang onto your old crappy games that looked so bright and shiny about 2 stages ago. 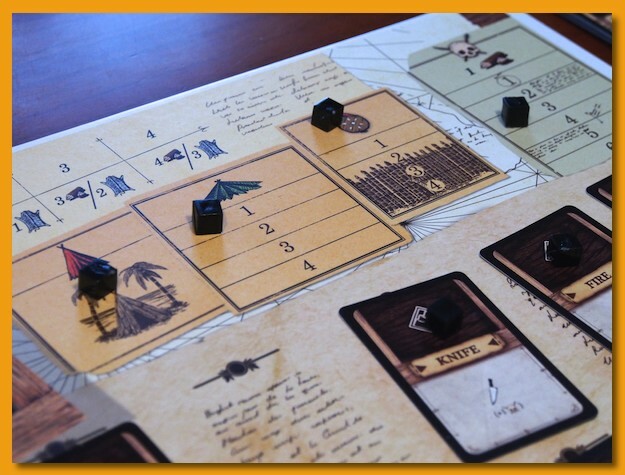 I’ve been having a lot of fun playing a “new to me” game called Robinson Crusoe: Adventure on the Cursed Island. The game is cooperative, in that everybody wins or everybody loses but it also features a solo variant so I have had a lot more opportunities to play the game than I would otherwise. Robinson is designed to support from 1-4 players and lasts a couple of hours. Players take on the role of a character that has survived a shipwreck on the island and your group has to try to accomplish some goal before being rescued. 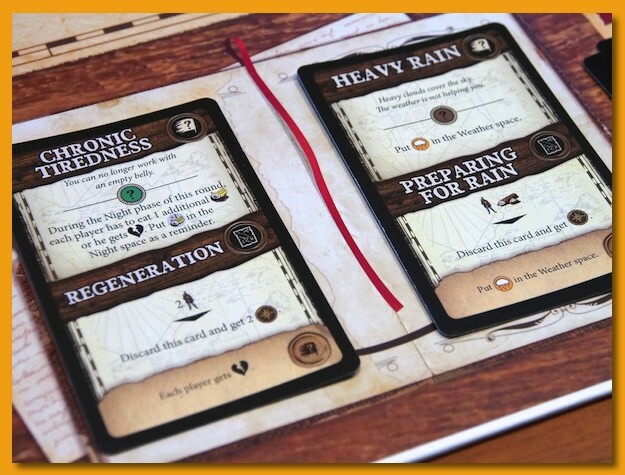 The game features several scenarios you can choose to play that define the goal you must accomplish but many other aspects of the game will keep that goal interesting and fresh. Each time you play you will be facing all kinds of new situations, events, adventures, beasts, and weather in your attempt to stay alive long enough and to meet your goal. 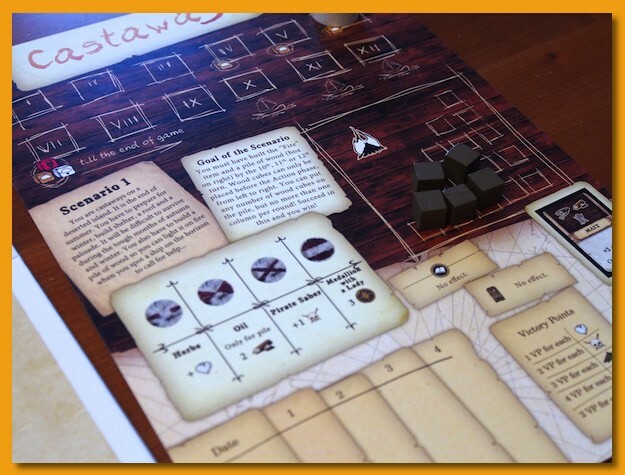 I’ve been focusing on the first scenario “Castaways”. You goal is to gather enough wood to pile it into a bonfire and to start it on fire some time in turns 10-12. Resources are extremely tight and many times you’ve got to make really tough decisions about using the wood you gather to build other things you need to build rather than adding it to your pile. On top of all that, you’ve got to gather food to survive each day but not too much as food rots each night so every day you’ve got to find at least some. For every situation and requirement the game throws at you that you cannot fulfill, you must take wounds. Too many wounds and you’ll die and lose the game. 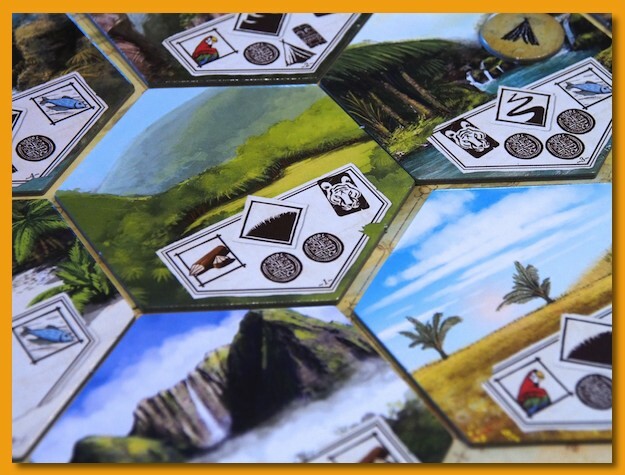 The game is steeped in theme and as the rounds unfold you have chances to explore the island placing randomly drawn tiles out onto the board. As you explore, you discover items you might be able to use, see beasts in the jungle that you can choose to hunt for food and fur (they may hunt you when you’re not looking! ), etc. However, you may also be forced to participate in an adventure while you were off exploring your new area and during this adventure you may be wounded by an animal, find old items, become injured in a fall that may affect your ability to play well later in the game when you finally can’t take the pain any more. 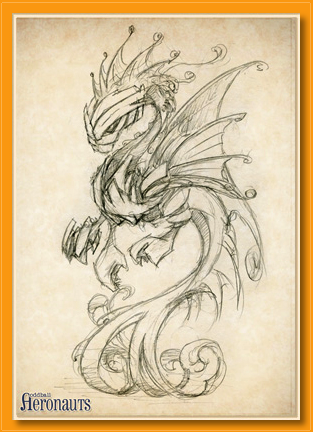 These adventures can occur during many different actions in the game while hunting beasts, building structures and items, gathering resources, or exploring. As in real life, trying to stay alive is a dangerous business and usually these adventures are a bad thing to have to deal with. They may only affect you but they may come back later to affect your whole group when other more global events occur. Each round a major event is uncovered, impacting the entire group. 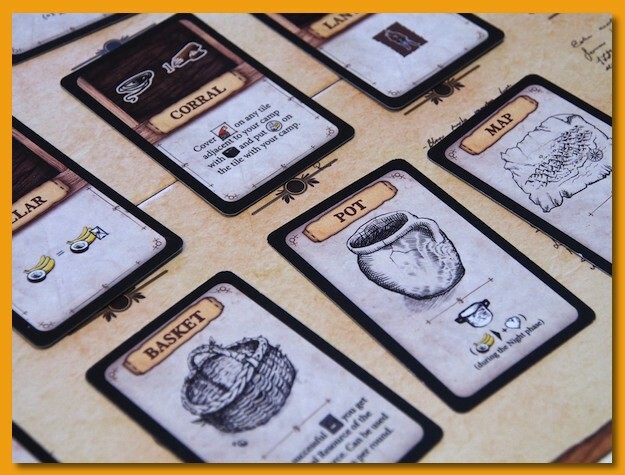 This event card is then placed near the bottom of the board and remains for a few turns allowing your group to deal with removing the threat described by the card. If your group ignores the threat, then you’ll be impacted again by the threat further reducing or at least impacting what you’re trying to accomplish. To prepare for hunting and scavaging predators, bad weather, and the coming winter storms, players can devote resources to building various structures that include a shelter to spend the night in (if you sleep outside you take a wound), a roof to keep off some of the rain, a palisade to fend of wild creatures, and a strong weapon’s level to also fight/kill creatures. If you ignore these structures too long, the weather will eventually do you in as the winter storms are brutal. You’re going to need some protection from them. But not too much; remember you need to put some wood on the pile and light it on fire. But wait, where would do you get fire? Each scenario starts with a field of inventions or ideas that your group has and if you choose to take actions to build them and manage to build them successfully (and hold onto them), you can take advantage of their special ability. 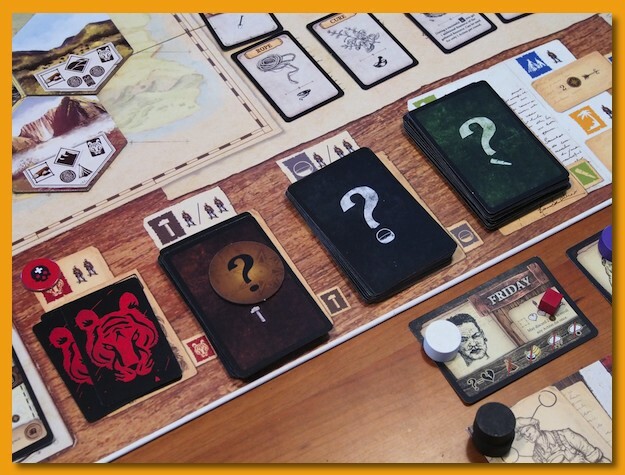 These inventions usually require you to give up some sort of resource or have explored a specific terrain type of the island, others require you to have built a prerequisite invention. I have to say, after 5 plays of the first scenario I’ve only won once and each game has been really different. The number of cards and which ones show up in any given game means there is an extreme amount of variability and replay value in the box. The rules aren’t overly complex but they’re woefully incomplete and a bit vague. It’s not uncommon to reveal an event and immediately have a question about how you might interpret what is required to fulfill it. However, in most cases, if you just try to think back to the theme and what might happen if the event occurred in real life, you’ll probably be close, if not spot on, to what the rules intended. I’m really looking forward to my next play. I’ve heard of people playing dozens of times on just the first scenario and not beating it and after having played I can see why. It’s really tough to survive let alone meet the goals of the scenario. That first win really feels like you earned it. 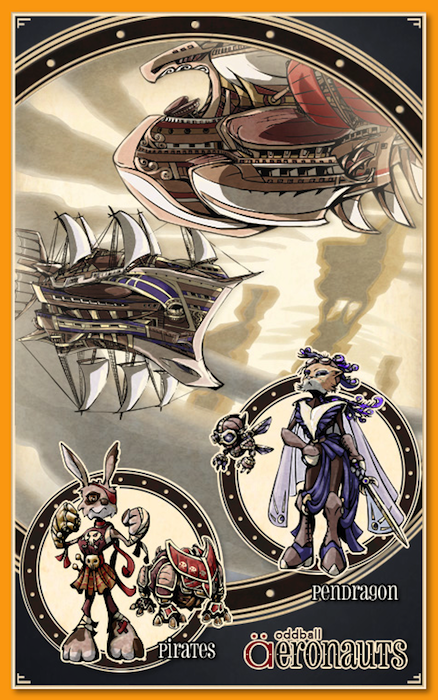 I recently ran across oddball Aeronauts on BGG and after scanning some of the artwork and the description, I jumped out to Kickstarter and backed it. Play-in-the-hand – Anywhere! Because oddball Aeronauts doesn’t require a surface to play on it can literally be played anywhere! On a train, in the school yard, in a convention queue, in the college library (get back to your books you! 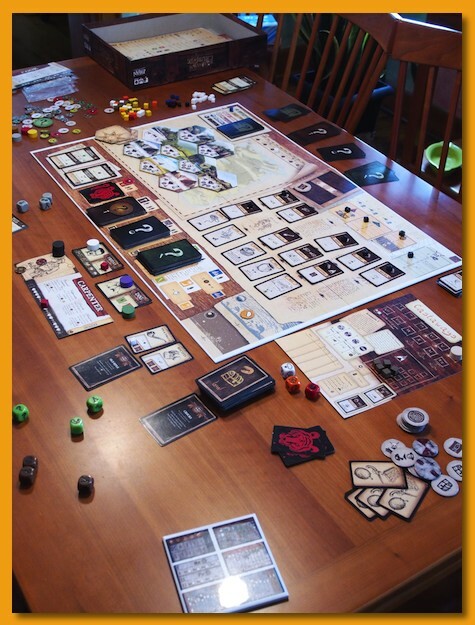 ), between gaming sessions – these are all very good and highly commendable places and circumstances for playing the game. The artwork immediately caught my eye, reminding me of Chris Riddell’s work on The Edge Chronicles. 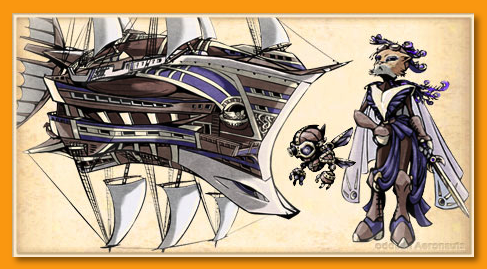 Flying ships, sky pirates, fanciful creatures, interesting characters, what’s not to like in this game?! 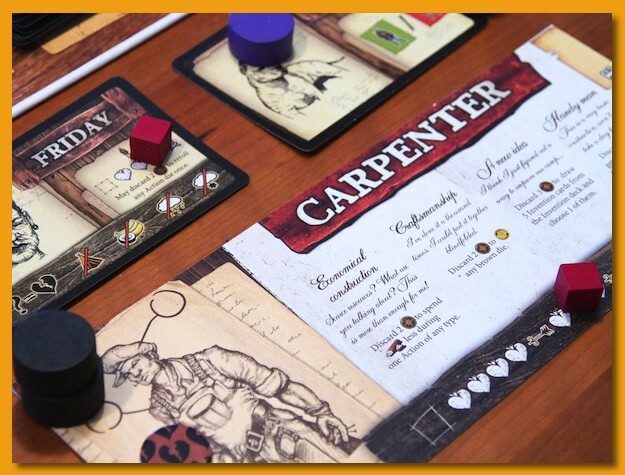 I’m always on the hunt for good two player games and one that provides a few minutes of fun in a small package AND doesn’t require a playing surface is already head and shoulders above other games. I’m really looking forward to my copy. 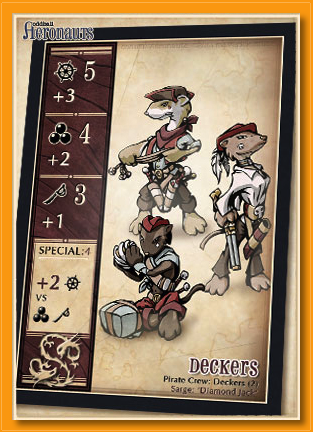 Each player faces off with a deck of cards playing the role of either the Pirates or the Pendragon officers. 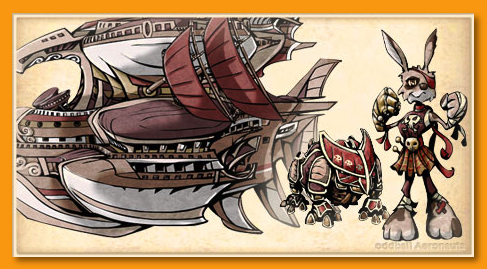 Taking turns, players attach each other, evade, board each other’s ships, react to events, and take damage. All of this takes place within your deck of cards and as soon as a player damages every card in the deck, she loses and her opponent is declared the winner. Jump out to oddball Aeronaut’s website and take a few minutes browse around. There are lots of info to learn more about the game, watch review videos, etc. If you like what you see, I encourage you to pledge some money towards the game. Let’s get this thing published!